When it comes to weekend brunch, I find myself trying to answer a big question: sweet or savory? An omelet filled with onions, cheese, and bacon topped with salsa? French toast battered in coconut and smothered with raspberry jam? Both sound amazing, and while I love a delicious sugar-filled start to my day, I usually end up choosing the savory option. Some of my favorite local brunch restaurants in Chicago? Over Easy. I love their Nueva Mexicana Omelet, which is stuffed with creamy goat cheese, salsa verde, onion, tomato, and corn, served with home fries and toast. Their sourdough bread is amazing! Kitsch’n in Roscoe Village has the best hangover cure ever – their chilaquiles. Order it with a Bloody Mary and you’ll be feeling great by the time you walk out the door. 😉 A tasty bowl of tomato bisque and a grilled cheese sandwich made with 3 year aged cheddar, fontina, and bacon? This is my go-to for brunch at Fork in Lincoln Square. And don’t forget to try a beermosa: orange juice mixed with Half Acre Daisy Cutter (a local, hoppy pale ale) along with your meal. You won’t be disappointed! While going out for brunch out is fun, I also like preparing brunch at home in my PJ’s while enjoying a cup of coffee. 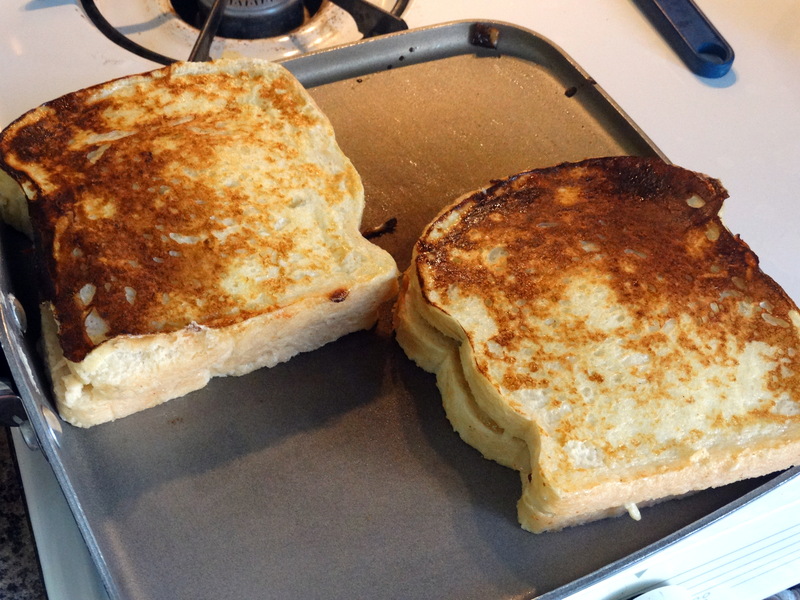 This past weekend I tried something new: savory French Toast. No cinnamon, nutmeg, or syrup on the list of ingredients for this amazing and filling dish! What do you need? Bacon, onion, coarse salt, red pepper flakes, a tomato, oregano, eggs, whole milk, cayenne pepper, white bread, shredded gruyere, olive oil, and fresh scallions. Begin by cutting 8 slices of bacon into 1/4-inch pieces and adding them to a large skillet over medium heat. Cook until nice and crispy, about 10 minutes. 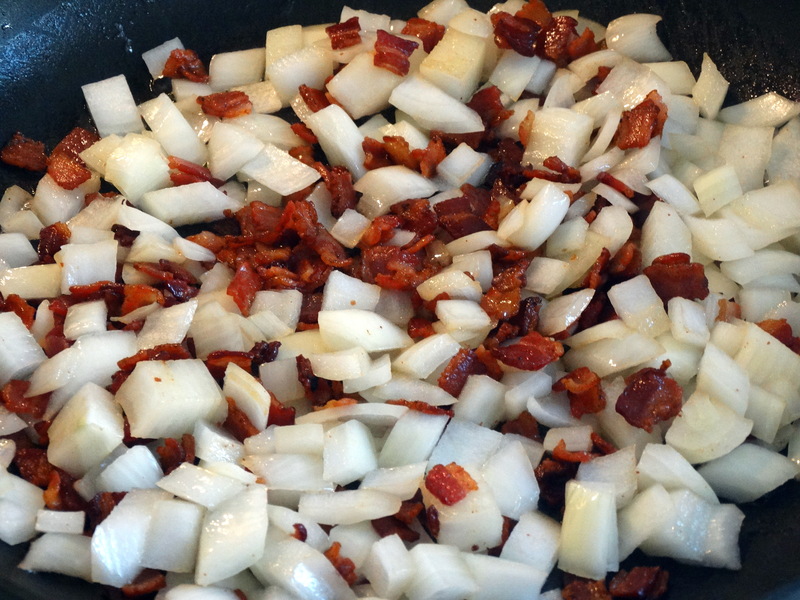 While the bacon is cooking, chop a small yellow onion into 1/4-inch pieces. Seed a medium beefsteak tomato and chop into 1/2-inch pieces. When the bacon is cooked, use a spoon to remove half of the drippings. Leave the bacon in your pan and add the onion along with a dash of coarse salt and pinch of red pepper flakes. Sauté until the onion is soft and translucent, about 10 more minutes. Next, add the tomato and season with a bit more coarse salt. Continue cooking until the tomatoes become soft and most of the liquid has evaporated. Turn off the heat, stir in 1 teaspoon dried oregano, and set aside to cool. Preheat your oven to 200 degrees. In a large bowl whisk 6 eggs, 1-1/2 cups whole milk, a pinch of cayenne pepper, and a dash of coarse salt until thoroughly combined. Transfer the egg mixture to a large, flat dish. I used my 9″ x 13″ Pyrex baking dish. Lay out 4 slices of white bread on your work surface. Top each slice with about 2 tablespoons shredded gruyere cheese. Next add a quarter of the bacon mixture to each piece of bread. Add another 2 tablespoons of gruyere on the bacon mixture and then cover with a second piece of bread to create a “sandwich.” Press down firmly to secure. Transfer each toast into the egg mixture and let soak for one minute, then flip and soak the other side for a minute. I worked mine in batches of two to allow plenty of space. While they are soaking, heat a large sauté pan with 1 teaspoon olive oil over medium heat. Cook each toast for 2-3 minutes per side. They should be nice and golden. When your toasts are done, transfer them onto a baking sheet and keep them warm in the oven. Use the skillet you cooked the bacon mixture in to cook 4 eggs, sunny side up. Heat your pan over medium heat, add your eggs, and sprinkle with coarse salt and pepper to taste. Cook until the whites are cooked through, but the yolks are still runny, about 3-4 minutes. Remove your toasts from the oven, topping each with an egg. Thinly slice 2 tablespoons fresh scallions and sprinkle them over the eggs, serve, and enjoy! Eat them while they are hot – I doubt you’ll be able to wait long to sink your teeth into this dish after all of that cooking! 1) Cut 8 slices of bacon into 1/4-inch pieces and add them to a large skillet over medium heat. Cook until nice and crispy, about 10 minutes. 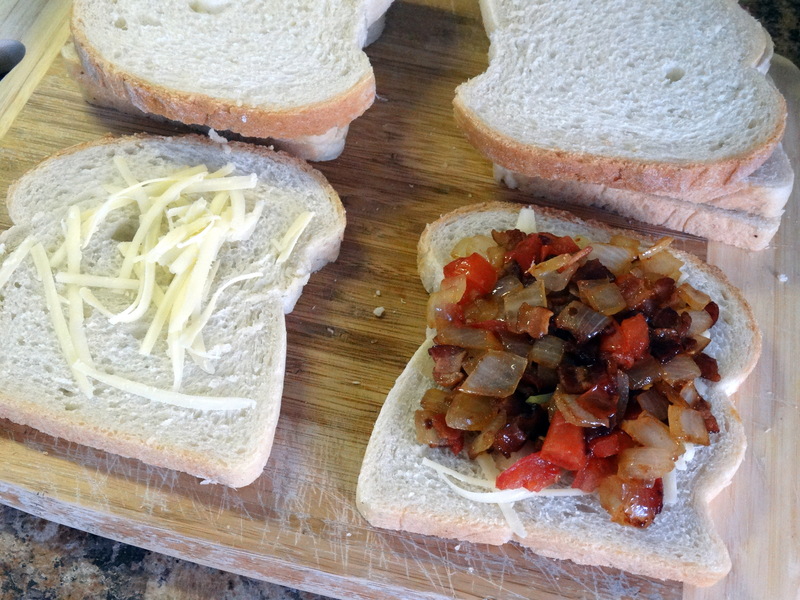 While the bacon is cooking, chop a small yellow onion into 1/4-inch pieces. Seed a medium beefsteak tomato and chop into 1/2-inch pieces. When the bacon is cooked, use a spoon to remove half of the drippings. 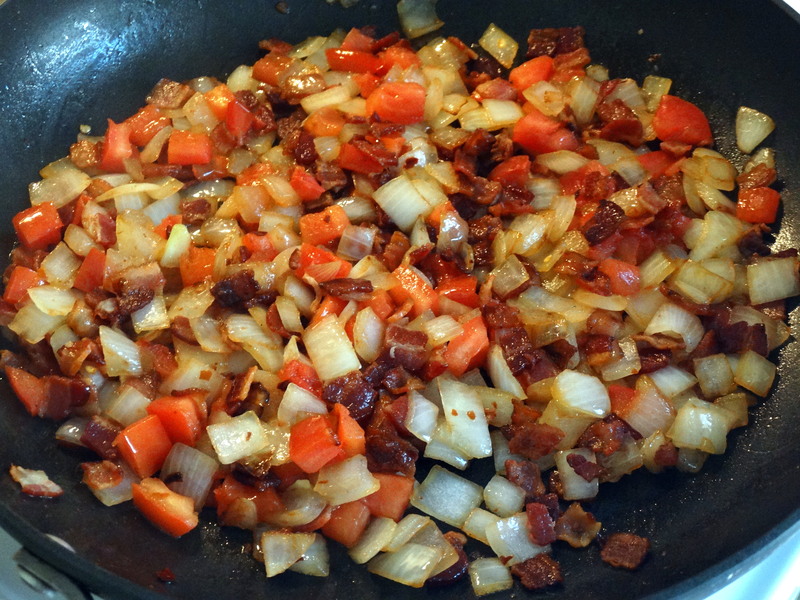 Leave the bacon in your pan and add the onion along with a dash of coarse salt and pinch of red pepper flakes. Sauté until the onion is soft and translucent, about 10 more minutes. Next, add the tomato and season with a bit more coarse salt. Continue cooking until the tomatoes become soft and most of the liquid has evaporated. Turn off the heat, stir in 1 teaspoon dried oregano, and set aside to cool. 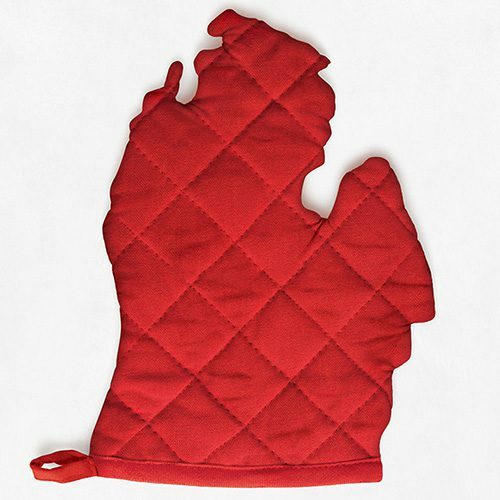 2) Preheat your oven to 200 degrees. In a large bowl whisk 6 eggs, 1-1/2 cups whole milk, a pinch of cayenne pepper, and a dash of coarse salt until thoroughly combined. Transfer the egg mixture to a large, flat dish. 3) Lay out 4 slices of white bread on your work surface. 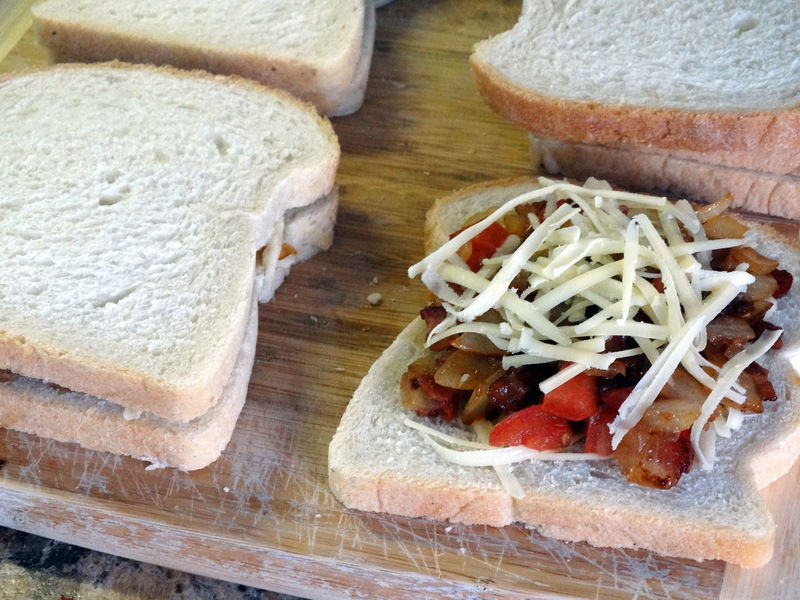 Top each slice with about 2 tablespoons shredded gruyere cheese. Next add a quarter of the bacon mixture to each piece of bread. Add another 2 tablespoons of gruyere on the bacon mixture and then cover with a second piece of bread to create a “sandwich.” Press down firmly to secure. 4) Transfer each toast into the egg mixture and let soak for one minute, then flip and soak the other side for a minute. I worked mine in batches of two to allow plenty of space. While they are soaking, heat a large sauté pan with 1 teaspoon olive oil over medium heat. Cook each toast for 2-3 minutes per side, or until golden. When your toasts are done, transfer them onto a baking sheet and keep them warm in the oven. 5) Use the skillet you cooked the bacon mixture in to cook 4 eggs, sunny side up. Heat your pan over medium heat, add your eggs, and sprinkle with coarse salt and pepper to taste. Cook until the whites are cooked through, but the yolks are still runny, about 3-4 minutes. 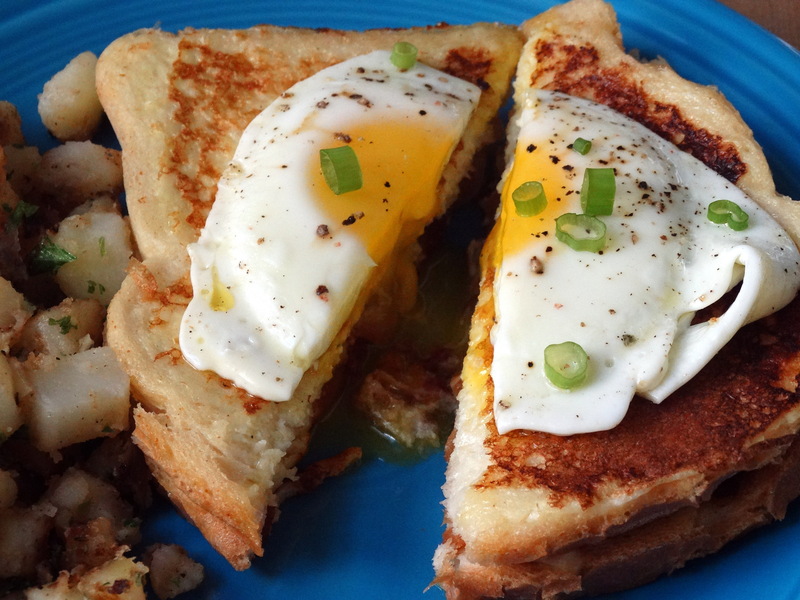 Remove your toasts from the oven, topping each with an egg. Thinly slice 2 tablespoons fresh scallions and sprinkle them over the eggs, serve, and enjoy! This looks amazing!! I love French toast but only eat it very rarely (too much sugar in the morning just makes me fall back asleep), so savory French toast sounds like the perfect solution for me. Thanks for sharing the recipe!